Tenth anniversary marked by first ever ten-day rally and new fundraising goal of $2 million! 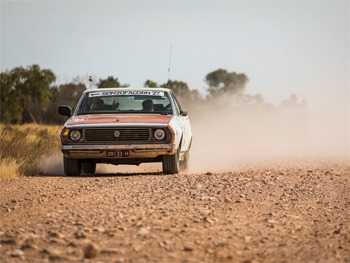 Shitbox Rally, the national charity event where teams of two tackle Australia's dustiest outback roads in cars worth less than $1k (aka shitboxes) to raise money for Cancer Council, has announced its 2019 dates. The 2019 route will start in Perth on May 8th and finish in Sydney on May 17th, travelling via the iconic Uluru. Previous rallies have always been seven days, making this the first ever ten-day experience to mark the tenth anniversary of the rally. Shitbox Rally is the largest independent fundraiser for the Cancer Council nationally and broke records in 2018 with fundraising totals reaching $1.974 million - the most money ever raised in a rally since it began. This has set the bar for a new 2019 fundraising goal of $2 million. James Freeman who founded Shitbox Rally in 2009 after both of his parents died from cancer within 12 months of each other, said overall fundraising totals since the rallies began are at $14,782 million which is a truly exceptional effort from all of our participants – our -Ralliers'. 'When I launched the rally back in 2009 I hoped that within five years we would hit $1 million raised each rally, but I never envisaged raising $2 million on the 10th anniversary rally. It is going to take a lot of commitment and hard work, but I am confident we will do it" James said. 'The 10-year anniversary rally had to be something remarkable, and what could be more remarkable than a cross continent trip. It will also be great to finish in the city where it all started 10 years earlier" said James. And what can the 250 teams expect for 2019? 'The longest rally in Shitbox history! Travelling West to East the terrain usually doesn't change as much as the South to North rallies, but that said, we are not staying on the same latitude so there will still be significant variation in terrain. There will still be a number of surprises for the teams and it will be a truly epic journey." said James.